Book a demo with one of our experts. 3.Book a Demo Choose suitable time for a demo. Send email failed. Please try again. Customers expect to be able to provide feedback and receive service in multiple channels; they want the option of ordering a product online, and then picking it up at the store or getting it delivered to their home. With Cross-Channel Integration you can provide customers the same experience online as in the stores, and enable them to move between the two channels without friction. Make the shopping experience seamless, and to give consumers new levels of convenience and choice. What would I get with Cross-Channel Integration? Restructure your organization and processes to enable a true cross-channel experience. Create a common IT backbone. Use business intelligence and customer relationship management in a more sophisticated way. 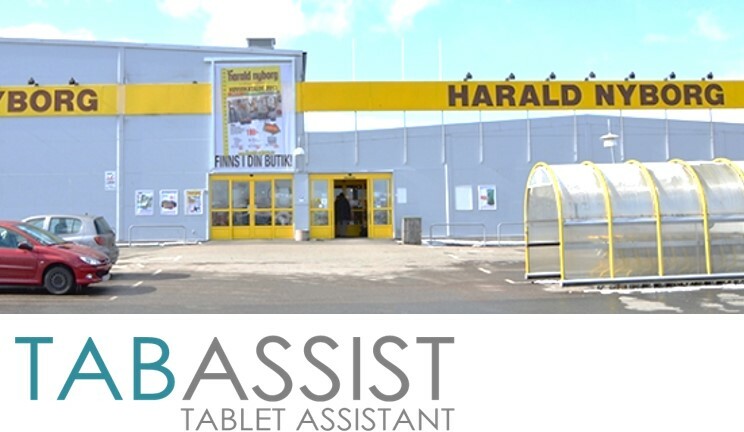 A Complete In-Store Tablet Solution. Sell "out of stock" articles. Secure the sale and customer satisfaction. No more time consuming phone calls. Provide a fast “Check Out” with mobile payment solutions. No more need for customers to stand in line. Make the payment anywhere on the shop floor. Improve the communication between the management and the sales assistants. Connect head quarters with sales assistants. Book a demo to explore much more. Interactive display for your store. They can register to your Loyalty Club and check-in in the store. Display marketing catalogs or commercial banners. TabAssist and TabStore Solutions are suitable for almost any retail industry area. An IT company focusing on re-inventing the retail experience for the future. We create innovative technological solutions for the retail industry. We take the best of both the online and offline world to create a seamless shopping experience. 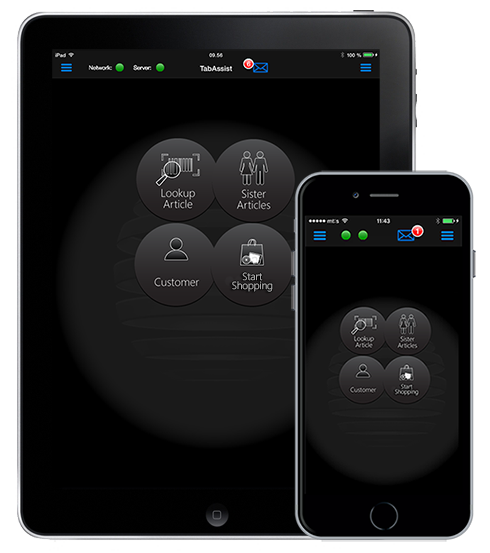 We create mobile solutions that empower sales assistants with critical information anywhere on the shop floor - right from their fingertips. We build mobile technology and cloud based solutions to increase retail efficiency. The TabAssist team is highly focused on Cross-Channel integration to give your customers a seamless shopping experience. We are excited to work with Harald Nyborg in Sweden. The highly motivated sales team has raised the bar for new and innovative customer service with “TabAssist”. Northwest Arkansas premier technology summit with a speaking lineup of industry leaders. The executives at Walmart have selected our ”TabAssist” solution among hundreds of tech company’s to pitch for the Walmart’s management. Walmart wants you. If you're a tech startup with a way to solve today's retail problems for the world's largest retailer, that is. This week, Walmart announced it would hold a Technology Innovation Open Call in October in conjunction. 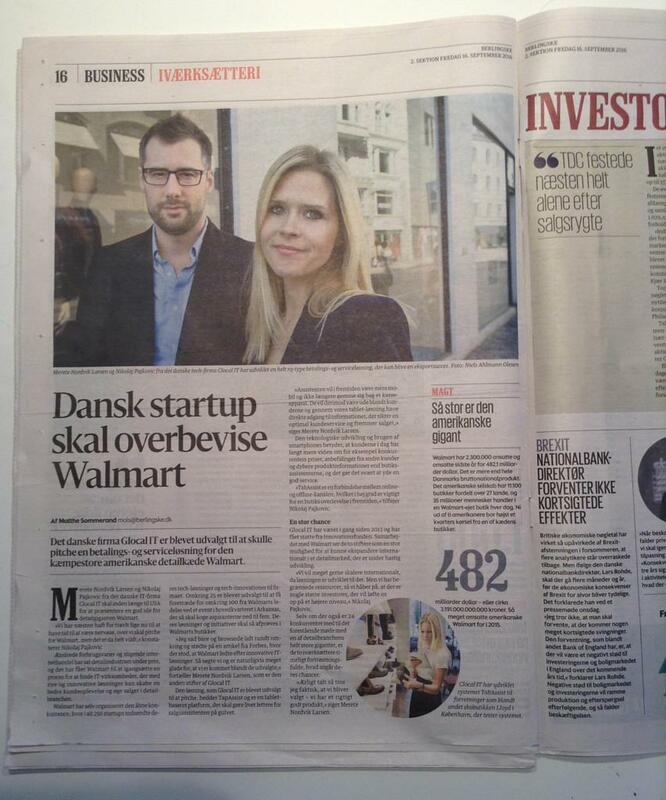 We are honored to be featured in Berlingske Business News. We have been selected to convince Walmart to use TabAssist. Follow us to see how it goes! We will attend TechBBQ 2016 September 20th in Copenhagen. Come and meet us at the Innovationsfond corner. TechBBQ is the quintessential and largest startup and innovation summit in Denmark and Greater Copenhagen gathering 1700 passionate people in the Opera House. Thank you for your support Innovation Fund Denmark. Please click on "I'm not robot", then click on send again. If you wish to be considered for any future positions, please send your CV and cover letter in English to: job@glocalit.com.